There are hundreds if not thousands of foreigners illegally working in Thailand. While most of them know about it and try to hide their profession as good as possible some aren’t even aware that they break Thai law especially guys working online and think they can do it on an education or even tourist visa. What means illegally working in Thailand? There are basically two things for officials to check if a foreigner is working legally: The compulsory Non Immigrant Business Visa and Work Permit. While it is pretty easy to check the foreigner for the Business Visa and if he or she has one at all or if it already expired, the second thing the police will ask for is the work permit. 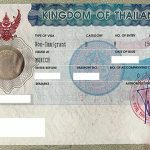 While in most cases that foreigners are illegally working in Thailand they don’t have a work permit at all, the labor law can be broken by a number of different reasons even if there is one: The Work Permit is expired, different employer than stated in the permit, different profession than stated in the permit or different work address than stated in the permit. Any of these changes have to be submitted to the labor department within 15 days. You are even supposed to keep the work permit with you at your workplace and in case the officials check and you have it on the desk of your apartment – you can be fined. It is important to know that the labor department doesn’t usually send staff to go around the country and check if foreigners are working in accordance to the laws. What rather happens is that someone that doesn’t like you goes to the labor department or the department of special investigation knowing that you don’t have a work permit and tells them the story and where you work so they can check and get you a problem. I do have a work permit and have never been asked by some official to show it to him – but I haven’t got an issue with anyone neither. While penalties for illegally working in Thailand can be severe I have heard of a lot of cases where especially teachers that have been checked and identified as illegally working they often just handed the officer some cash in hand – depending on the case and the mood of the officer around 10,000 to 20,000 baht – and all was good, the case was dropped. And then I know of a Canadian guy that got arrested in Phuket for renting out condominiums that he owned without having a Thai Company and a work permit. He wasn’t even aware that he was acting against the law – but I’m sure the teachers were. Foreigners who engage in work without a Work Permit can be punished by imprisonment of a term not exceeding five years or a fine ranging from 2,000 Baht to 100,000 Baht – or both. Any foreigner who violates the conditions of his work as described in his Permit can be punished by imprisonment of a term not exceeding three months or a fine of up to 20,000 Baht. Foreigners who do not have their Work Permit with them while working can be punished by imprisonment of a term not exceeding three months or a fine of up to 10,000 Baht. An employer who permits a foreigner to work in his compnay without a Work Permit or to act in violation of the nature of the work specified in the Permit can be fined from 10,000 baht up to 100,000 baht. Just do what you are supposed to and get the paperwork done, Thailand is such a beautiful country to live in, I don’t get why people would risk it instead of taking some effort to get a Business Visa and a Work Permit. You don’t get why people would risk it instead of taking some effort to get a Business Visa and a Work Permit? Please tell me how to get a business visa without having at least 2 million Baht start capital or how to get a work permit for helping your Thai girlfriend to run her guesthouse. i have seen a lot of Foreigners selling Gemstones and jewelry in Silom ,Bangrak,China Town areas, Particularly in Jewelry Trade Center ,Silom Road ,a lot of Asian Foreigners working without work permit,Most of the Foreign owned jewelry stores Hire the salesman from their own Countryman ,those workers came to Thailand on Tourist, Retirement ,Student Visas. I know more than a dozen of people who illegally work in Thailand (no business visa, no work permit) for years and never got caught. Not just teachers, even normal company employees.